For soup lovers having a stockpot in your kitchen is a great boon. Products like the Circulon Stockpot make the art of creating soups and stews much easier. The size also allows you to cook larger batches for canning and preserving, which saves you money over the life of the pot. This is a very impressive stockpot. It has a built in strainer so you can drain off items right from the pan. That is a very clever and time saving design. Another great feature is the locking lid  you wont worry about it slipping off while your straining a dish. Overall the Circulon stockpot seems very sturdy, but not so heavy that its hard to manage. With a ten quart capacity this pot can be used as a boiling water canner in a pinch too! The Circulon stockpot costs about $160, but you can find it on sale for $89. It is a little pricy as you can get full stainless for that amount, but the clever design features may make the extra worth your while. Note that the draining holes in the lid cannot be closed. This may prove problematic for some recipes. 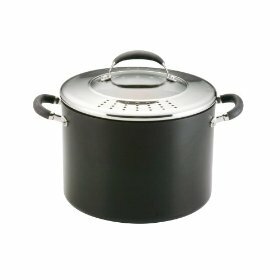 In reading customer reviews, nearly everyone who has purchased this stockpot has been very pleased with its performance. The nonstick feature has made for easy cleaning, and they really love the ability to pour off from the pot without trying to maneuver a strainer. The lock on lid gets many great comments from a safety perspective, and the size makes it very serviceable for large meals and those things that a cook might wish to make in bulk. The only complaint (and it was mild) was that people wished they could close the straining holes in the lid. This is a well-constructed piece of Circulon cookware thats useful to nearly any kitchen. It is big, so if youre seriously stretched for storage space you might want to find a smaller stockpot. Otherwise, this is a solid investment that lives up to its promises with few, if any, issues.